Start in Buenos Aires and end in Rio de Janeiro! With the discovery tour In Search of Iguassu–Buenos Aires to Rio, you have a 17 day tour package taking you from Buenos Aires to Rio de Janeiro and through Buenos Aires, Argentina and 8 other destinations in Latin America. 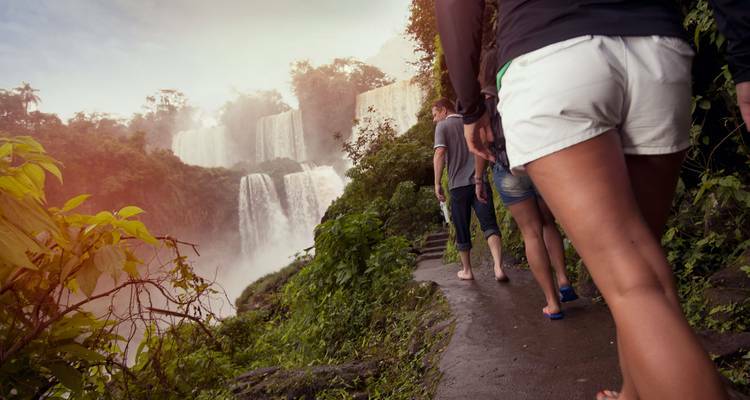 In Search of Iguassu–Buenos Aires to Rio is a small group tour that includes accommodation in a hotel and hostel as well as an expert guide, meals, transport and more. Very good organisation and activities, some of the accommodation wouldn't suit all needs which is the only reason this isn't a 10. Thanks for the detailed and honest review Emma. Our world deserves more you! We look forward to seeing you again soon. I love travelling with G - having most things organised for you or a guide there ready for advice is so helpful. Brilliant guide, good accommodation, value for money. I was very happy with my trip. G Adventure did a great job! Special thanks to our CEO Flor Alborcen! She is INCREDIBLY TALENTED at what she's doing. Fantastic tour! Enjoyed every minute of it. Amazing! Thanks for choosing to see the world with us. Because I really like the responsible, adventurous and friendly way of traveling G offers! I've done three tours so far and all of them were great. This tour is part of G-Adventures’ 18-to-Thirtysomethings range, which is designed for younger travellers specifically between the ages of 18-39. If you're outside of the age range and like the look of this itinerary then why not check out G Adventures' 'Southern Highlights' tour, which follows a similar route and is open to all ages over 18. Of course, we can! If you wish to arrange additional accommodation then please contact our customer support team once you have a confirmed booking. TourRadar only requires a deposit of $99 to confirm this G Adventures booking. The remaining balance is then payable 65 days prior to the departure date. For any tour departing before 23 June 2019 the full payment of $1,908 is necessary. No additional cancellation fees! You can cancel the tour up to 65 days prior to the departure date and you will not need to pay the full amount of $1908 for In Search of Iguassu–Buenos Aires to Rio, but the deposit of $99 is non-refundable. But, the deposit is fully transferable to future bookings with G Adventures.